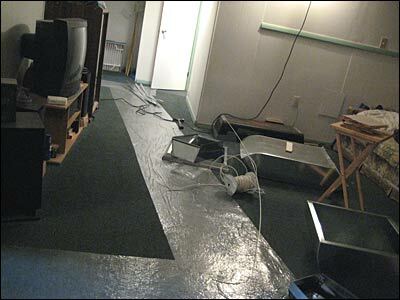 Before they did the removal they laid down what seemed to be a big sheet of plastic wrap on the carpet. I recommend requesting this since furnace removal and installation can be a bit dusty and dirty. Removing the furnace was kinda fun to watch. It certainly made the furnace room seem a lot bigger. 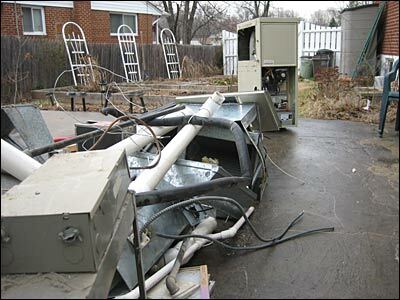 The trick is to have the furnace removed on the same day the heat pump is installed. That way it's not so cold (or hot if it's summer) that night. I didn't realize there was so much stuff in a furnace system. Our filter system for the furnace hadn't been working well for the past several years. It was an electrostatic system that clicked all the time. We eventually had to turn it off to get some sleep. 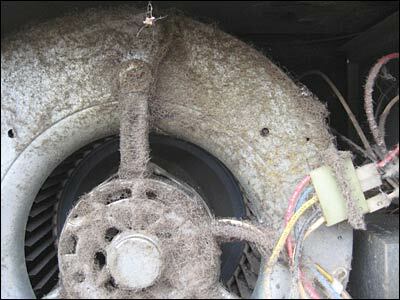 There was a lot of dust inside the old compressor.